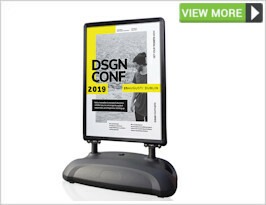 Creo supply a range of portable pavement signs including A-Boards, Poster displays, Forecourt Signs, Swing Signs, and Chalk Boards. We stock a range of styles and materials from plastic, steel, aluminium and timber to suit every requirement. Signs can be supplied plain or with vinyl lettering, digitally printed graphics or paper posters. 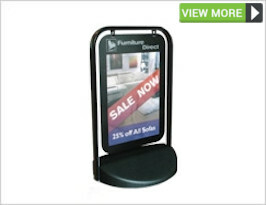 Call our sales team on 1890 866 811 for more information on the best type of portable pavement sign for your business. 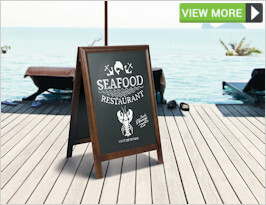 Make the most of your outdoor advertising space with our huge range of pavement signs. A Pavement Sign can be placed almost anywhere from the pavement to your car park or forecourt; whichever position will maximise its visibility. 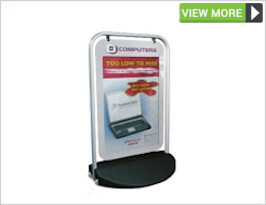 Pavement signs attract attention and drive footfall. We have a selection of frame styles including A board frames, also known as sandwich boards, large forecourt signs, swing signs, snap frames, chalkboard pavement signs and water fillable signs. In terms of the branding we have options for replaceable laminated printed posters, permanent vinyl graphics and even chalkboard surfaces to write your own message on. Our pavement signs are available as frame only or we can print the posters or graphics for you. 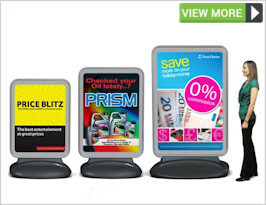 Ideal for marketing and advertising, particularly for retail and point of sale.